Champion professional wrestlers came to Secaucus. 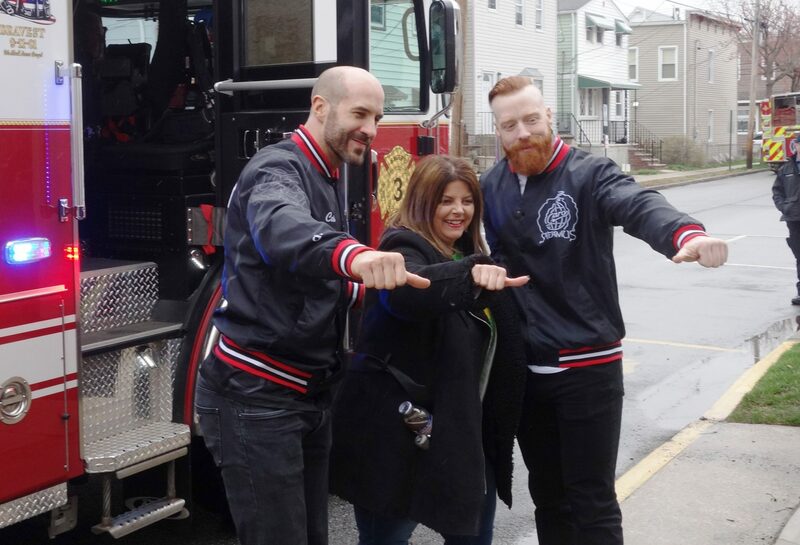 Although known professionally for his red hot temper that matches his fiery colored hair, Sheamus, four-time World Wrestling Entertainment World Heavyweight Champion wrestler, looked more than a little humbled when he stepped into the Seventh Street Firehouse in Secaucus on April 4. Sheamus and Cesaro, who together are known by fans as The Bar, were driven to the 7th Street Station in a fire truck with lights flashing. Both men, who are among the best in the professional wrestling world, seemed in awe and grinned as they waved at firefighters, public officials and fans waiting to receive them. Both wrestlers were participants in WWE WrestleMania, which took place on April 7 across the river at MetLife Stadium in East Rutherford. He’s even found success as a tag team competitor, joining forces with Cesaro to win the tandem titles on both Raw and SmackDown. But staring at the trophies and other firehouse memorabilia, Sheamus stared in awe. “I feel like a kid,” he said, as he rang the historic fire bell that hung in the firehouse’s rear recreation room. The two wrestlers also helped carry in gifts they brought that included new couches, kitchen appliances, end tables, and board games paid for by cellular service provider Cricket Wireless. With that portion of Seventh Street closed to traffic, firefighters, police officers, politicians and residents spilled out of the fire house to great the WWE superstars. Councilman Rob Costantino even suggested to Sheamus that he might body slam Secaucus Mayor Mike Gonnelli – a joke nobody took seriously. 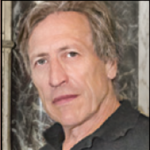 Former Deputy Mayor John Reilly said he recalled going to the Capitol Theater (now CVS) on 48th Street and Bergenline Avenue in Union City to see wrestling shows there years ago. “You wouldn’t believe how popular those shows were and how many people crowded in that small theater to see them,” he said. This was one of a number of events happening around WrestleMania weekend in which WWE partnered with the community around one of pro-wrestling’s biggest events, just three miles from MetLife Stadium. “We chose Secaucus because this town is so close to MetLife stadium,” said Cricket Wireless Market Director Michon Walls. Cesaro is a former European rugby star who was banned from league play due to excessive aggression. But even he seemed as awed in the firehouse as Sheamus, leaving his legendary mercilessness in the ring. The one time United States champion and part of the wrestling powerhouse “Real Americans” team has developed a cult following. A number of Secaucus kids stared up at him as he walked in, and seemed pleased to see him. Cesaro, however, may be more than his ring personality claims, since he reportedly is extremely cultured, and speaks five languages. Local fire officials also walked the two wrestlers through a photographic history of the all-volunteer department, showing them images of past and present fire vehicles. The 7th Street Fire House is home to one of the largest of the fire department’s vehicles, which is used to help with fires in some of the taller high rises as well as to allow firefighters to fight fires in smaller structures from above. One historic vehicle from the 1930s used to be part of the annual Fire Fighters Parade, but has since been relocated in a fire museum elsewhere in the country. Sheamus and Cesaro laughed about one of the fire engines that was painted yellow. Both wrestlers, however, made it clear who they believed the real heroes are, when speaking to the firefighters. The two wrestlers also gave two free tickets to WrestleMania on Sunday in MetLife Stadium to the Deputy Fire Chief Joseph Schoendorf.